Description For the most wild, yet most homely narrative which I am about to pen, I neither expect nor solicit belief. Mad indeed would I be to expect it . . . Yet, mad am I not and very surely do I not dream. But tomorrow I die, and to-day I would unburthen my soul. Thus the narrator begins to confess to murdering his wife in The Black Cat, just one of many fascinating creations from short story master and poet, Edgar Allan Poe. Exploring themes as diverse as spirituality, astronomy, science and depravity, Poes writing is as powerful and arresting today as when he was first published. Poes 6 years in Philadelphia, 1838-1844, were his most productive. Not only did Poe edit and provide critical reviews for very successful magazines, but he also invented the modern detective story. While in Philadelphia, Poe penned such classics as The Tell-Tale Heart, The Fall of the House of Usher and poems like The Haunted Palace and To Helen. While living in Philadelphia, Poe went from the high of being a popular lecturer to the despair of learning that his wife Virginia was ill with tuberculosis. The brief and tragic life of the author, his times, and literary legacy are interpreted in the building that once sheltered Poe and his family. 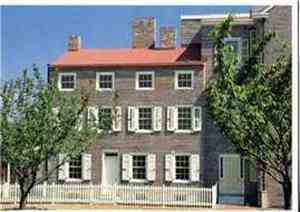 Add Edgar Allan Poe National Historic Site to your free online travel itinerary.